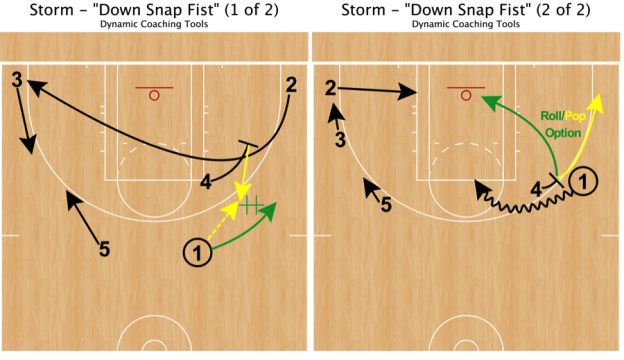 Doug Brotherton of Dynamic Coaching Tools shares the most effective plays from each team in the WNBA Finals. 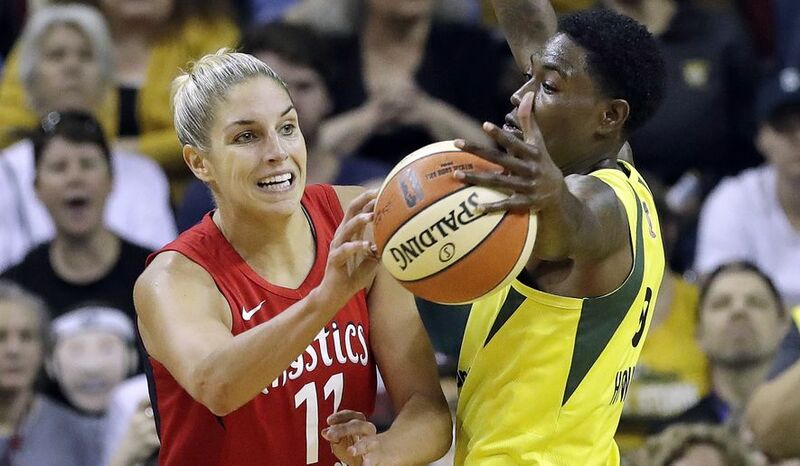 After a highly competitive WNBA Finals Game 2, the Washington Mystics look to make this a series vs the Seattle Storm. Game 3 tips off Wednesday night at 7PM Central on ESPN2, with the #1-seeded Storm having an opportunity to close out a WNBA Championship vs the 3rd-seeded Mystics. Coaches should be tuning in, as both teams run some tremendous stuff offensively. Highlighted below are three highly successful sets from each team. Thank you to Ben Dull from SplitThePost.com for providing the videos for this preview. See for yourself why the WNBA really is the best bargain in basketball! This BLOB set involves Bird setting a flex screen for Stewart, then receiving a down screen. 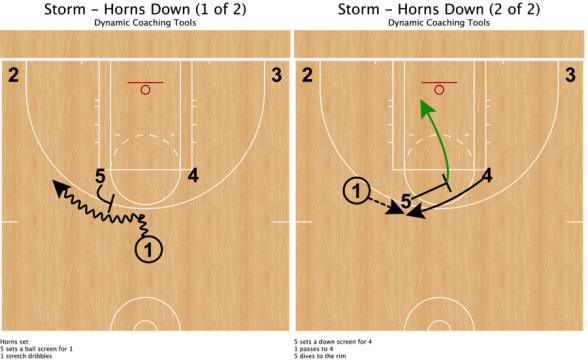 The Storm have several different Horns looks, but this ball screen that flows into a down screen is tough to guard in transition. The Storm love to include Stewart in “two game” action on an empty side. They use DHOs, ball screens, and slips to create the advantage for the 2018 WNBA MVP. This set shows a double stagger, before a split, into a rip (re-screen) for the back cutter. 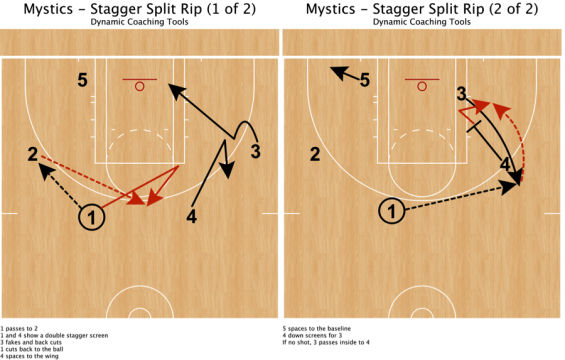 Great counter to a traditional double stagger! 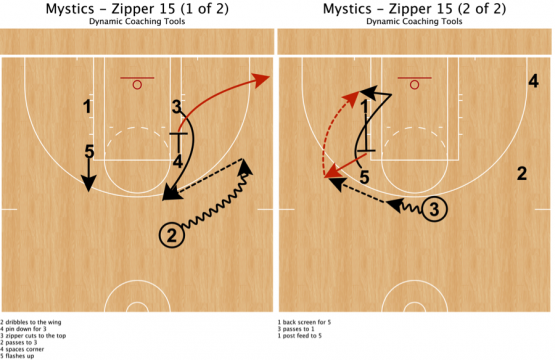 The Mystics use a zipper cut to trigger this back screen action with Toliver and Delle Donne. 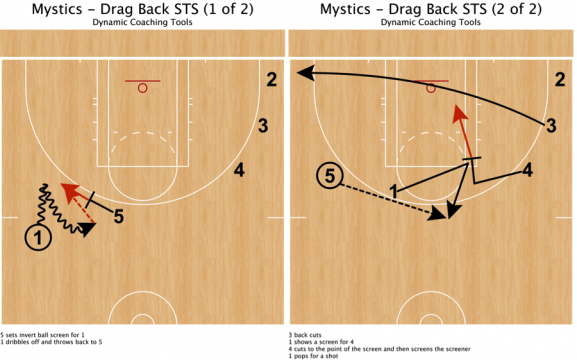 This is just one of the ways that the Mystics use a back screen to get the basketball inside. This set uses a drag screen and throw back to set up the screen-the-screener action. Toliver shows a screen for Delle Donne, before she actually receives the screen for an open three. Another action that will continue to be critical in the series is the two-game with Stewart on the empty side. The Storm lead the WNBA in three point shooting, and that action puts the defense in a scramble situation. On the flip side, the Storm must be ready to guard the screening actions involving Toliver and Delle Donne. The Mystics went away from Delle Donne in the second half of Game 2, so look for them to establish her early. The use of back screens, ball screens, and screen-the-screener actions to free up Toliver and Delle Donne are important to getting back into the series. Go follow @splitthepost and @DynamicCoaches on Twitter for more excellent content!